There are few things that are cheaper and more entertaining than bubbles. While you can buy solution at the store, it is also easy to make at home from ingredients that you probably already have in your kitchen. At its most basic level, you can make bubbles with dishwashing soap and water. However, they will last longer if you use glycerin or corn syrup. Both additives help slow down the evaporation process, thus making the bubbles a bit sturdier. Start by cleaning and drying your container thoroughly. It's important to make sure that your bucket is extremely clean and dry as any leftover residue from cleaning products or any dirt left in the bucket will make it virtually impossible to get really good bubbles. Following the chart for how much solution you want, fill your container with water. If your water is particularly hard (full of minerals), you may find that distilled water works best. Add the dishwashing soap slowly. Stir as gently as possible without creating additional suds on the surface. Before you move onto the next step, wait until suds pop and the water stops moving. Add glycerin or corn syrup and stir as gently as possible, without creating additional suds on the surface. For best results, leave the solution to sit overnight. If you don't have time to do that, leave the solution to sit for at least 15 minutes. To use the solution, pour into a shallow pan like a pie plate, and use a bendy straw as a wand and have fun! 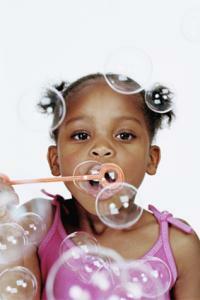 You can use a store-bought wand or bubble toy to blow bubbles, but really anything with holes in it can become a wand. The trick is to make sure that the thing you want to use as a wand is thoroughly clean, and wet with solution. Give these a try and see what kinds of bubbles you can make! Pipe Cleaner - Pipe cleaner is a favorite type of wand because you can mold it into any shape you want easily. For a basic wand, try looping the top half to form a circle. This will still leave you with a handle. Because pipe cleaner is so pliable, you can also double loop the wand, make it into a square or even a cube. Your Hands - Make sure your hands are very clean and very wet with solution. Form a circle with your fingers using either your forefinger and your thumb (like you were making an 'okay' gesture) or by touching thumb to thumb and middle finger to middle finger. Blow gently until you have formed a bubble. Because your hands are already soapy - you can catch most of your bubbles. String - Tie together a large loop out of any kind of string. Clear fishing line works especially well, but you can use plain twine or yarn as well. Let the string soak in the solution, and let the solution sit so that there are no suds on top. Using both hands, spread the string out so that it forms a loop with a film of solution on it. Walk backwards quickly, or spin around - this will blow air through the string and form a bubble. Berry Baskets - If you get your berries in plastic wire baskets, these actually make great bubble wands for producing lots of tiny bubbles. Cookie Cutters - Cookie cutters make a super easy and fun way to blow bubbles with shapes. Believe it or not, there is more to do with bubbles than just blowing them. Try these fun tricks on a dry day. Mix together equal parts dishwashing soap, glycerin and water. The mixture comes out very thick and will need to sit for an entire day before you can use it. However, the bubbles that this solution produces are long-lasting. Do you want bubbles that show up in a black light for a very cool party? Take a highlighter and cut it open. Any fluorescent color will work. Soak the highlighter in a very small amount of water (approximately one-half cup). Add that water to your bubble solution. To make the solution very strong, you may need to use two to three highlighter pens. You can also make glow-in-the-dark bubbles using washable glow-in-the-dark paint from a craft supply store. Use two parts solution to one part paint. Surprise your friends by poking a bubble with your finger. Because the bubble does not want to break surface tension, you can soak your hand in soapy solution and poke a bubble without popping it. The trick is to make sure you have a solution that uses glycerin, and you have soaked your hand really well. Who says bubbles have to be clear? Using washable paint to add some color to your mixture. Add the washable paint slowly (dark colors work best) until you have your desired color. Note that when they pop, they will leave a stain on clothing or paper, but since the paint is washable, it will wash out. There are few things that are more fun for kids than blowing bubbles. Young or old, everyone can have good, clean fun with a few ingredients in the kitchen.